A world-first virtual uterus is being built in New Zealand - and it could lead to new tools for diagnosing and treating abnormal pregnancies. 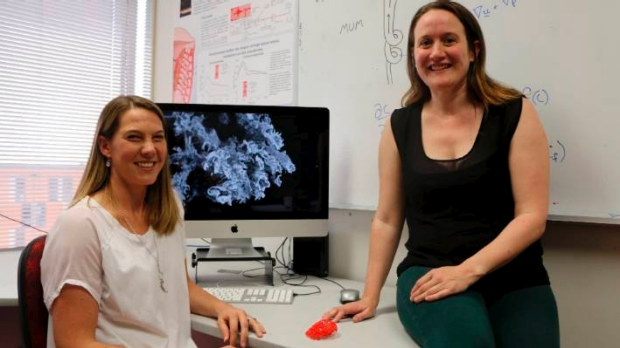 Dr Alys Clark from the Auckland Bioengineering Institute and Dr Jo James from the School of Medicine at the University of Auckland were awarded a Marsden Fund grant to investigate the changes in blood flow that affect a mother's ability to nourish her baby. They aim to create a virtual uterus to mimic dynamic changes in blood vessel structure and simulate blood circulation between the uterus and placenta during pregnancy. The Marsden Fund awarded the researchers $NZ954,000 over three years for the project. It was part of $NZ85.6 million allocated to fund science and research to 136 national and international research projects across the country. Clark, an engineer interested in tools that can help in medicine, said pregnancy was a difficult time to observe what's going on with health. "It's a magical time with all these changes going on, but at the same time it's hard to observe clinically," she said. "If somebody not pregnant is [unwell] there are numerous tests that can be used, such as CT scans, but you can't use in pregnant women." The computer model would help to better understand blood flow to the developing foetus and likely lead to improved early detection and diagnosis of foetal growth restriction (FGR). The placenta nurtures a growing foetus by offering oxygen, nutrients and antibodies, and by eliminating waste throughout the pregnancy, Clark said. This vital process fails in 10 per cent of pregnancies, leading to FGR where babies are born abnormally small. The disorder is almost impossible to predict and difficult to diagnose at an early stage of the pregnancy, even with modern medical imaging. "We lack understanding of the mechanisms that control the development of a healthy placenta, so the majority of pregnancies affected by FGR are not diagnosed until delivery," Clark said. "We want to spot that right from the first or second time the woman gets an ultrasound so we can do a better job of managing." FGR also increases the risk of still birth, premature birth, and later in life adult heart disease and diabetes, she said. Past research has focused on small blood vessels between the uterus and the placenta. However, Clark's computer models suggest larger blood vessels also play an important role in regulating blood flow to the placenta. In the first year of the project, the pair will draw on current data to map how a uterus functions in the early stages of pregnancy. The second stage is to build the virtual world that reflects that. "We can then take ultra sound measurements of how the uterus is changing, and compare it with the computer-based simulation to try and develop new tools to spot the cases where the baby is not getting enough food." In the future, they aim to create a virtual placenta and a long-term a virtual pregnancy.